Europe may express sympathy with African asylum seekers in word, but this is often contradicted by their actions in deed. 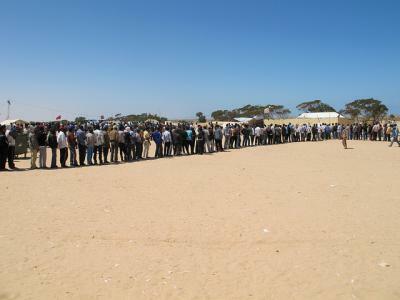 Migrants queue at Shousha refugee camp, on the Libyan border. Photograph by Guerric. Last month, at least 17 people drowned when a boat filled with hundreds of African migrants sank in on its way from Libya to Italy. The week before, at least 36 had died attempting to make the same treacherous journey in similarly overcrowded and unseaworthy vessels. The accounts of African migrants dying in the Mediterranean Sea are horrifying. But perhaps even more shocking is just how commonplace such stories have become. Over the course of just four days in May, for instance, the Italian navy rescued around 6,000 people as they attempted to cross to Europe in crammed boats; full and flimsy boats like those that faltered earlier this month are reportedly leaving Libya almost continuously; and there is no shortage of people from various parts of sub-Saharan Africa and the Middle East arriving at Africa’s northern shores to await their turns to attempt the voyage. The EU’s border agency Frontex suggests some 42,000 migrants have made the journey from North Africa to Italy this year, a sharp rise on the past two years. And this is before we even mention the tragedy last October when over 360 people drowned off the Italian island of Lampedusa. When the worst happens and migrants die off the coasts of Libya or Italy, European countries often express sympathy and grief. After Lampedusa tragedy, for example, there was a high degree of soul-searching amongst European governments. However, as has often been the case, a momentary human concern soon evaporated and European countries soon restarted their well-worn strategies of rhetorically undermining the plight of asylum seekers through clever but disingenuous arguments, of emphasising the need to protect Fortress Europe from ‘invading African hordes’, and of trying as best they can to offload any burden that might come with protecting refugees onto poorer countries. One way in which Western countries justify their failure to protect asylum seekers and discredit the plights of migrants is through the notion of ‘asylum shopping’. This rhetoric works by implying that the people who reach European shores are not genuinely fleeing persecution, but are economic migrants attempting to enter other countries under the pretext of discrimination. True asylum seekers, it is suggested, would simply apply for refuge in the first country they reached. This argument often plays well to domestic audiences but rarely takes account of the reality of many migrants’ situations. Firstly, the distinction between economic and political migrants is often a false one. The rhetoric suggests that some asylum seekers are ‘bogus’ because they were motivated by economic choices, but when it comes to the tens of millions of displaced people from across Africa, there is no meaningful distinction between economic discrimination and political discrimination, and little difference between economic refugees and political ones. The false dichotomy implies there is a choice involved in economic migration unlike in the face of political persecution, but the reality for those embarking on risky journeys to escape their homelands, there is no such choice. Secondly, these arguments hugely misconstrue where most refugees actually end up. Despite the hysteria that sometimes accompanies debates around asylum seekers in the West, Western countries take on just a fraction of the world’s displaced persons. According to the UN Refugee Agency, of the 21 countries that hosted over 1 million refugees between 2003 and 2012, just one European country − France − made the list, which is in reality dominated by the likes of Pakistan, Iran, Kenya, Tanzania and Chad. Thirdly, the notion that not applying for asylum in the first country reached constitutes ‘asylum shopping’ is similarly misguided. For example, many of those who are willing to risk their lives to reach Europe begin their journeys in the deeply repressive Eritrea, and for Eritreans there are few safe havens in the whole East African region, let alone in neighbouring countries. Crossing over into Sudan, for example, is hugely unsafe. There are numerous human trafficking gangs that operate around refugee camps in the east, abducting displaced people to hold them for ransom, while security forces are known to kidnap Eritreans to return them home. Djibouti is also hostile to asylum seekers and often imprisons Eritreans claiming that they are security threats. Libya meanwhile has been a nightmare for African refugees both under the rule of Muammar Gaddafi and since his downfall, with many being discriminated against and violently targeted. The unstable situations in Somalia, Egypt and South Sudan do not offer much better options for Eritrean asylum seekers, while Kenya − on the other side of Ethiopia − appears to be growing increasingly intolerant of its own mostly Somali refugee community. Finally, relations between Eritrea and Ethiopia are tense and Eritrean asylum seekers risk getting sucked into the low-level conflict that has continued between the two countries since the 1998-2000 border war. For Eritreans fleeing their home countries therefore, seeking asylum in the first, second or even third country of arrival is simply not a viable option. As well as disingenuous rhetoric that aims to undermine the legitimacy of asylum seekers, European countries also attempt to relieve themselves of the duty to protect refugees through more concrete measures. Some of these are more subtle, such as through the funding of large refugee camps outside their own borders, but some are far more direct. Before Gaddafi’s overthrow, for example, Italy and several other European countries maintained close links with Libya, part of which were centred on cooperative measures to keep European shores free of migrants. Under the Italian-Libyan Friendship Pact of 2008, for instance, the two countries significantly strengthened border controls and Libya was encouraged to intercept potential migrants. Italy was to provide half the funding for the bolstered system as well as the companies that would be used for the initiatives, while the rest of the money was to be sought from the EU. Under a 2009 agreement, Libya also agreed to allow Italian coastguard to stop boatloads of African migrants on the seas and forcibly return them to Libya. Italy was not required to conduct any screening of the travellers whatsoever − potentially in violation of international law − before they sent them to Libya where they faced a high chance of discrimination and abuse. There are a number of things the world can do to begin correcting the iniquities of the global asylum system, the unfair burden it puts on certain countries and the huge gaps in its protection of the world’s most vulnerable people. This change can start with amendments to international treaties and conventions. To begin with, the 1951 UN Refugee Convention is desperately out of date. 1951 is a long time ago and the world has changed dramatically since then in terms of communication access, mobility of individuals and the places from which most refugees derive. Most countries in Africa were still colonies in 1951, and although the convention was amended in 1967 to broaden its applicability to beyond Europe, little else has been amended over the past six decades. For example, the 1951 convention still has no clear provision for burden-sharing and defines refugees in outdated terms that make little sense in today’s world. As it stands, the convention fails to protect refugees. It was created in an environment that has changed dramatically, and reflects a time when the world was a bigger, more certain place and international flows of people were on a much smaller scale. The Dublin Regulation, which contains the EU’s rules on allocating responsibility for processing asylum seekers, also needs to be reviewed and updated to give small countries such as Malta a fairer deal. According to Dublin II, which has its origins in a 1990 intergovernmental convention, the obligation to examine an asylum seeker’s request rests on the country where the application was first submitted. This puts an unfair burden on countries situated in the south and east of the EU. Many asylum seekers would actually prefer to be elsewhere in the EU where they probably have relatives or contacts but legally, countries such as Malta, Greece, Italy and Spain are often obliged to keep them. These frontline countries have tended to respond by warehousing potential refugees and asylum seekers in often inhumane conditions or in some cases by engaging in ‘refoulement’ − the returning refugees to territories where their life or freedom may be threatened. In 2004, the European Community produced its Qualification Directive, a European Union-wide approach to refugee protection that is broader in some ways than the 1951 Convention. However, it is nowhere near as generous as other regional guarantees such as the 1969 African Convention, the 1984 Cartagena Declaration of the Organization of American States or the 2001 Bangkok-Principles. Part of the reason for this difference is that Europe has treated refugee protection as part of its immigration policy − immigration law is about controlling entry; refugee law should be about offering protection. Changing a few conventions will not protect asylum seekers and iron out the inequalities and problems in the global asylum system overnight, but it is a start. And an urgently need one at that. After all, if the world continues to rely on outdated definitions and treaties to deal with Africa’s migrants, stories of rickety boats carrying vulnerable people sinking in search of safer shores will not stop any time soon.